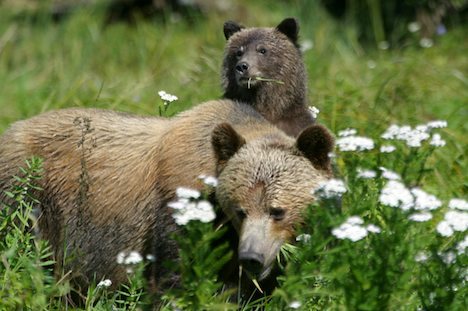 A few of the best ways to experience the grizzly bears of Knight Inlet is by booking a multi night stay at the fly-in lodge in Glendale Cove, and embarking on tours from there by boat or to a viewing platform on land. If you have less time, a day tour by boat is also available from Telegraph Cove on Vancouver Island. Grizzly Bears, Ursus arctos horribilis, Knight Inlet, British Columbia, Canada. Picture of a Grizzly Bear mother and cub grazing on grass in Knight Inlet, British Columbia, Canada.